The election to the Karnataka State Bar Council have been set aside by the election tribunal which found various illegalities in the conduct of the elections by the Special Committee in violation of the Bar Council of India resolution and has ordered that the election be conducted de-novo before May 15. The decision of setting aside the entire elections was taken on Tuesday i.e. April 17 by the Election Tribunal comprising Justice SK Mukherjee, former Chief Justice of Karnataka High Court who presided over the meeting, Justice RD Vyas, former judge of Gujarat High Court and Justice Mridula Mishra, former judge of Patna High Court. The meeting considered the complaint received via email on April 3 by HR Durgaprasad, a candidate for the post of a member of Karnataka state bar council elections, alleging irregularities in the polls where voter list was not published as per proper procedure, police protection was not taken while carrying ballot boxes which were given to a private agency for transportation to the strong room in Bengaluru and kept in a room without any seal and no CCTV/ video recording was made of the voting process. He said as per the guidelines, the returning officer should have been a retired high court judge but in real it was the secretary of Karnataka Bar Council. 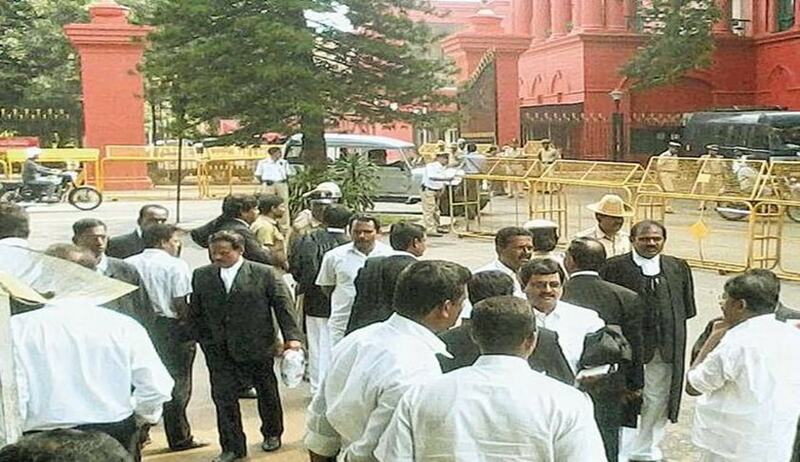 “The election of the Karnataka state bar council reveals a very sorry state of affairs,” the tribunal held. After considering the allegations of the complainant, the tribunal observed, “As can be seen, there has been an admitted non-compliance of the BCI Election guidelines which were approved by the Supreme Court of India. No former High Court judge was appointed as Observer to look after the overall conduct of elections and to issue appropriate directions to the returning officer. Further, no police protection was obtained for transportation of ballot boxes by the polling team and in fact it appears the entire task of transportation of ballot boxes was handed over to a private agency which transported the boxes on its own even without any polling team accompanying it. Further, there was no police protection at the polling booths. There was no seal or signature of RO/ ARO on the door of the strong room where the ballot boxes were kept”. “We, therefore, set aside the entire election of state of Karnataka Bar Council. The special committee constituted by the BCI should conduct the election de-novo from the stage of polling after printing fresh ballot papers upon compliance of all formalities as per the directions of the Supreme Court of India and Bar Council of India. The BCI should appoint a former judge to be returning officer and another former Judge from some other state to be the observer of the elections. “The council should also request the Chief Justice of Karnataka High Court to direct the police official to co-operate with the returning officer and they observer. The Bar Council of India is to take necessary steps for conducting and completing the elections at the earliest, preferably before May15, 2018,” the tribunal said. Although it was incumbent on the part of the special committee as per the BCI Election resolution circulated to all state bar council on February 22 to engage a retired high court judge as returning officer to look after the overall conduct of elections, admittedly no such appointment was made for elections of Karnataka state Bar Council. “…We feel that in the absence of impartial returning officer or observer the entire election would vitiate. The object of engaging a retired High Court Judge as returning officer or an observer to look after the overall conduct of elections was needed to ensure free and fair elections. The in-house procedure adopted by the special committee of Karnataka state bar council is in shocking violation of the BCI Election resolution which has been duly approved by the Honorable Supreme court also. “Therefore, it amounts to violation of orders of the Honorable Supreme Court of India”. The tribunal also noted that there was no proper police escorts for polling teams, authorised personnel, carrying of ballot boxes and adequate police force at police boots also given a complete go by. “The ballots were carried from different polling stations after elections through a private agency and with no safety or security…nothing has been mentioned as to how and when it was received in the strong room at Bengaluru. This so-called strong room was found to be without any seal. A simple lock was there. All these go to establish that elections have been held in an unfair manner and the special committee has acted in most casual and careless manner. The tribunal found itself at a loss of words to comment on the attitude of special committee in engaging private agency for transporting ballot boxes in “gross non-compliance of the above resolutions”. “Admittedly neither the tribunal was approached when purportedly government did not provide police protection, noted the Tribunal, adding that no police protection was obtained at the time of transportation of ballot boxes papers in spite of directions of the bar council of India”. “It appears that just for formality the special committee has sent the letter but it was never followed up,” it said. Srinidhi V, advocate appearing for the special committee of Karnataka Bar Council, submitted that police help was sought but could not place any material before the members to show that police help was declined by the administration or that the letter even reached the police headquarters. “It was incumbent upon the special committee to either approach the Chief Justice of High Court or the election tribunal for seeking a direction on this issue instead of engaging a private agency. “With the Supreme Court vide its order dated March 13th directing respective committee/s appointed by Bar Council of India to follow the directions given by the BCI, the special committee of Bar Council of Karnataka was under a mandatory obligation to follow each and every guideline relating to conduct of elections issued by the BCI,” the tribunal noted. Advocate Saurabh Agrawal, appearing for the complainant, drew the tribunal’s attention of the serious lapses and contented that ballot boxes were transported by private agency and kept in a room without any seal bearing signature of the RO and the room was opened on several occasions by staff members of the special committee and some of the candidates of election who are men of members of special committee. He alleged that the ballot papers have been tampered with and the CCTVs manipulated to suit the sinister purpose. The committee noted that though there was no evidence to support this very contention, even the observer of the tribunal in his report dated April 4 indicated that there was no seal and signature of either the RO or the observer on the door of the strong room where the ballot boxes were kept. The tribunal concluded that “there was complete violation of all the norms of election and in particular the guideline number 5 of the Bar Council of India which stipulated that the strong room should be open and close with the seal bearing signature of the observer, the RO and therefore, such a serious and obvious lapse is certainly raising a big question mark on the fairness of the RO and the special committee in the conduct of elections and it cannot be overlooked or ignored. The purpose of elections is to get the true representatives of the advocates. Here in the present case, the special committee and its staff seem to have acted in most arbitrary and unfair manner”. Who were these local observers? On video coverage of the polling, Srinidhi admitted that CCTV coverage could not be extended to all polling booths but in three of the sensitive polling booths - namely Chikodi, Kudligi and Jamkhandi - video coverage was done and “local observers” were requested to take photographs of polling process as far as possible. “What does he mean by word ‘local observer’ we fail to understand,” the tribunal remarked. “The tribunal is of the opinion that when the special committee and returning officer were aware that there was sensitive polling booth, it was incumbent for them for arranging the CCTV coverage. This too is a serious lapse on their part. Who were the local observers, how were they appointed? It is not known to anybody. The secretary (of state bar council) has kept silent on this query,” it said. It is to be noted that another candidate named HC Shivaramu had also lodged the complaint with similar allegations of tampering with ballot papers.